A conservative city in northwest Iowa is hosting its inaugural festival to celebrate lesbian, gay, bisexual, transgender and queer people. Orange City, which has a population of about 6,200, will host the three-day OC Pride 2017 event starting Friday. 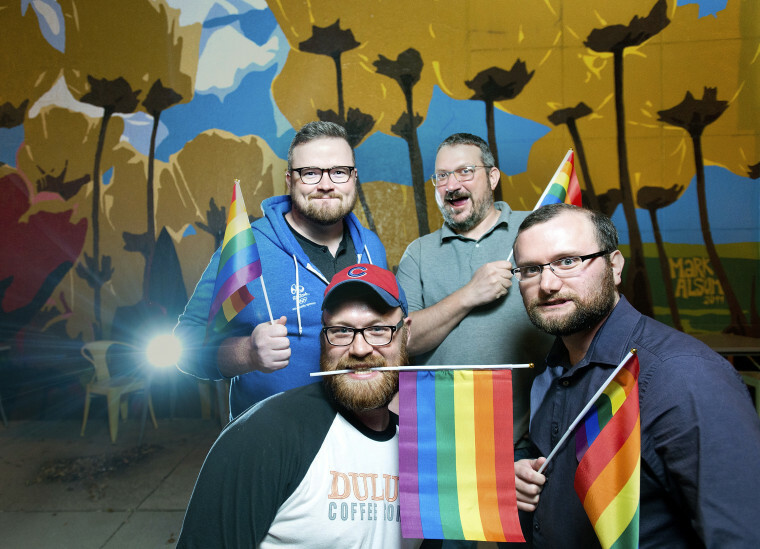 The event is the brainchild of newlyweds Mike Goll and David Klennert and two of Goll's longtime college friends, Steve Mahr and Cody Bauer, both of whom are straight allies. “We started small, because it is a baby pride, but we hope to continue and grow” Goll, who said they expect about 200 people to attend, told NBC News. The festival will include dancing, live music, a movie screening, information booths, storytelling and brunch. Goll is particularly excited about the festival's "Stories From the Edge" event, where people who have felt like outcasts and outsiders are invited to share their stories. Goll said he hopes straight allies and members of the Orange City business community also attend the event and show their support. Mahr — a straight ally, a business owner and one of the event's organizers — owns Town Square Coffeehouse and Kitchen, where several OC Pride 2017 events will occur. While the event's organizers said the response to the festival has been largely positive, some critics have voiced their concerns. Sioux County Conservatives, a political group, has criticized the event for celebrating what they believe the Bible classifies as a sin. And on Wednesday, State Representative Skyler Wheeler echoed the group's sentiments, urging residents not to attend “events that promote sin." “We’re all so overwhelmed with a lot of love and a lot of support. It seems there are few angry voices —a couple here and there — but mostly people are really curious and give us nothing but well wishes,” Goll said. The pride organizers want to make OC Pride a recurring cultural event, similar to the city's annual Festival Latino, which celebrates Latin culture, and the Orange City Tulip Festival, which showcases Dutch influences on the local customs. “We already have plans for next year, and we’re hoping to build upon the momentum that we started this year and just keep it going," Goll said.